As a Mom of three almost-grown sons, I know how important and difficult it is staying in God's word daily. There is always something competing for your attention. However, I want to encourage you to make spending time with God a high priority. Today's blog is a review of a book that would be a GREAT tool to help you to balance a busy life and spend time in Bible study. 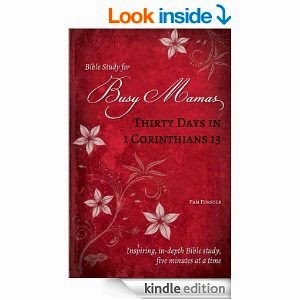 I have been asked to write a honest review of Pam Forster’s book, “Busy Mama’s, Thirty Days in 1 Corinthians”. This is an excellent bible study that is great for any woman! However, If you are a busy Mom or Grandmother with younger children, then this is the perfect book for you! Pam Forster has divided 1 Corinthians 13, the Love chapter, into daily studies that can be done in 5 minutes. Of course, if you would like to dig even deeper, or have more time, she has ideas for that as well. As a homeschool mom, I appreciate that after each day's study, Pam includes a section to be done with your children. This not only helps you retain the bible material but helps plant seeds of God's word into your children's heart as well! Pam Forster did an excellent job breaking down this chapter and showing us how to dig for deeper meaning of each verse. To put it in simple terms, it’s like a college level study done on a child’s level! I loved it! Pam Forster is not only an author of books but has a blog as well. 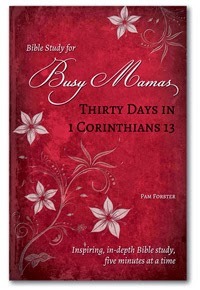 You can find Pam’s blog as well as order your copy of this bible study and more study books at: http://www.doorposts.com/ I received a free copy of this book from the publisher via Book Crash book review program. However, I would gladly pay for a great bible study such as this! I highly recommend this book. One more thing, I have a very good friend and mentor named Maggie. Maggie always encourages me to stay in God's word. At one point in my life I was homeschooling three boys, helping Chad in the ministry, and helping with my parents and other family, etc. I was feeling very discouraged about my bible study time and went to her for advice. As always, Maggie's words of wisdom brought me encouragement. She advised me to lay out my open bible on the kitchen counter and as I was making lunch or washing dirty dishes to read a verse or two out of my Bible. (it's not about quantity as much as quality) I would meditate and think on that verse all afternoon. The open Bible would be a constant reminder of the importance of God's word in my life. So whatever season you are in life, I want to encourage you to feast upon God's word and strengthen your spirit every chance you can!